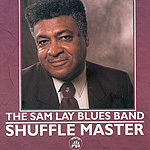 Drummer Sam Lay is the quintessential professional; he surrounds himself with solid sidemen, provides a swinging beat, and while you don't notice his playing you do come away thinking, "That was one hot band." Lay is a hell of a solid blues/R&B soul singer, as well. This new collection of soul and electric boogie woogie with Lay both fronting the band and providing the back beat is spirited, listenable bar blues. The backing band is tight, and contributes some nice original songs, too: guitarist (and label owner) Fred James' "Both Sides of the Fence," and harpist Billy Farlow's "River City's Jumping." Lay also turns in a traditional performance on a cover of Lightnin' Hopkins' "Mojo Hand."